We recommend the installation and glazing of Window Factory Double Glazed Windows and Doors be carried out by qualified technicians (such as window installer and glazier) or builders. One of the options for installation of double glazed windows in a brand new home, is the method requiring use of brackets. Standard brackets are made of aluminium and are 120mm x 40mm x 5mm and are used to attach the window to the brick. Brackets are attached to the window first before window is fitted into the aperture. Before starting to attach the brackets, it may be prudent to check the size, style and position against order. As a rough guide, unless the double glazed window is at least 10mm smaller than the opening on each side, it is not advisable to attempt installation without professionals. The brackets are attached in no particular order, using 30mm screws and it is necessary to maintain the window level during this process. 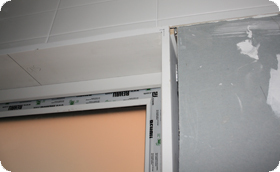 The brackets are strategically placed and are located 100mm from the bottom and top of the double glazed window, while the remaining brackets are affixed between 350-400mm in between the top and bottom brackets. The number of brackets used depends on the window size. Notably, the size of screws varies from the bracket attachment stage; the standard screw for joining bracket to brick is 60mm long. Window insertion involves fitting the new double glazed window with brackets into the aperture, which is a two-stage process. 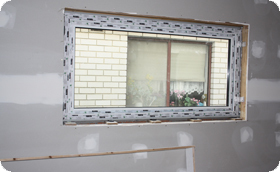 The first stage involves levelling the window horizontally and applying packers until the desired level is reached. The second stage entails using packers on the sides (vertically); to prevent tilting forwards or backwards, so the window does not fall out when it is no longer manually supported. The packers are fitted directly under the brackets on the side. On first application, the screws are tightened lightly, and only finished tight after all the screwing points are started. Failure to leave the screws gently fixed may result in the window curving slightly on one side. If the side looks bent, it is possible to decrease the magnitude by releasing the screw somewhat, adding packers then re-tightening the screw. To achieve the best results and to take advantage of high performance of our double glazed windows, we recommend that you apply expandable foam around the window, to close off any gaps. 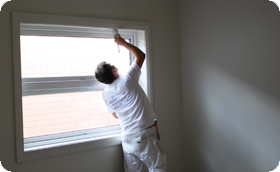 Sealing off cavities, cracks and empty spaces between window and wall will reduce the transmission of noise and ensure the double glazed window is weatherproof. If the render is completed outside, the use silicon is not obligatory, if not or if the brick is clear then silicon must be used not only to seal and waterproof around the window, but to protect the surface of another sealant - expandable foam, which is easily damaged by radiation. Inside, it is popular to either have brackets covered by gyprock or by reveal and/or architraves depending on customer/builder specifications. 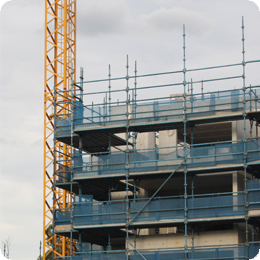 We offer consultation services to advise and offer solutions at any stage of the process. To start, apply glass/glazing packers on the bottom section of the frame/sash, on top of the indentation for glazing in the profile. The width of the packers should be between 5-7mm. 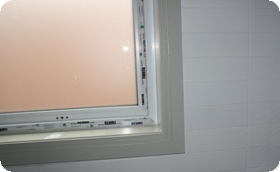 This will raise the insulated glass unit, and even if you install the window frame correctly, it is still necessary to keep the glass straight and centre it inside the window. The double glazed unit differs from a single pane of glass in that if the double glazed unit is not centred, it will be obvious and it will compromise the modern and stylish design of the window. The glass should be centred, that is, the distance of the gap at the top is the same as at the bottom. The side packers will keep the glass straight and prevent movement inside the sash. From the top, measure about 1/3 of the height of the glass pane, and by using plastic glue or silicon, attach glass packers to the side of the glazing indentation in the profile. For best results, the suction cups should be used for the next step. Place the glass in the prepared area. By using vacuum cups, it is possible to move the insulated glass unit around inside the glazing area, to make slight adjustments in order to achieve the desired position. Finally, using a rubber or plastic hammer, tap the glazing bead or strips around to hold the glass in place. Where appropriate, (not on fixed panels) fit the handle and hinge covers. Test the new double glazed window or door by opening and closing to ensure it is operational.